Mark is currently working in the wildFIRE Lab within the Earth System Science Research Group where he splits his time between managing the lab, and undertaking research on the ERC funded ECOFLAM Project. Mark’s background is in palaeoenvironmental studies, in particular the identification of human impact upon past landscapes. During his PhD within Geography at the University of Exeter, he focussed on the analysis of pollen and charcoal preserved in lake sediments to identify changes to the vegetation structure of the English Lake District during the Mesolithic and Neolithic. Mark has a wide range of laboratory and fieldwork skills. His field experience has ranged from lake sediment coring in China, to controlled forest fires in the USA. In the laboratory, Mark has a very broad range of skills including flammability testing of natural fuels, acid-processing of rock/sediment samples, microscopic analysis. 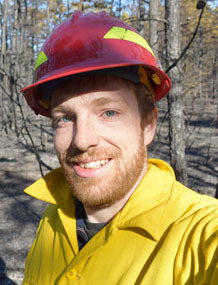 Mark’s research interests have developed through his postgraduate, technical, and research positions and include reconstruction of past environments (mostly through analysis of lake sediments), and more recently contemporary wildfires. Mark is particularly interested in reconstructions of past fire activity and the impact they have upon the landscape. Mark has used a wide range of proxy techniques including analysis of pollen, charcoal, chironomids, sediment geochemistry (including Carbon Nitrogen analysis, and scanning x-ray fluorescence), and radiocarbon dating. Post wildfire assessment of ecosystem damage, carbon loss, and monitoring of recovery, Woodbury Common, Devon, UK. PAST Project: Precolumbian Amazon Scale Transformations. Preparation and interpretation of pollen datasets. Post wildfire severity analysis of Winter Hill (Lancashire) and Carn Brea (Cornwall) heathland fires. Understanding and interpreting the Eden Project’s peatland biome (Eden Project/University of Exeter Collaboration Fund). An interdisciplinary study of contemporary ecology, hydrology, and palaeoecology of an ecologically important anthropogenic peatland. ECOFLAM – The impact of plant evolution on fire behaviour. Laboratory experimental design, undertaking of experiments, and analysis/interpretation of data. The pollution impact of tourism on a natural landscape: Juizhaigou National Park, China. Palaeolimnological analysis to identify the impact of pollution related to a rapid increase in tourism of a UNESCO World Heritage Site. Pollution signals in recent lake and pond sediments near to industrial sites of North-West England. Lunt Meadows archaeological site, North-west England. Laboratory processing and interpretation of sediment samples from a site of Neolithic settlement. Met Office Pollen Monitoring. Set up, analysis, palynological training of staff, and quality control of the Exeter pollen monitoring station for the Met Office pollen forecast. Grosvenor MJ, Jones RT, Turney CSM, Charman DJ, Hogg A, Coward D, Wilson R (2017). Human activity was a major driver of the mid-Holocene vegetation change in southern Cumbria: implications for the elm decline in the British Isles. Journal of Quaternary Science, 32(7), 934-945. Copyright © 2017 John Wiley. &. Sons, Ltd. The dramatic decline in elm (Ulmus) across a large swathe of north-west Europe in the mid-Holocene has been ascribed to a number of possible factors, including climate change, human activity and/or pathogens. A major limitation for identifying the underlying cause(s) has been the limited number of high-resolution records with robust geochronological frameworks. Here, we report a multiproxy study of an upland (Blea Tarn) and lowland (Urswick Tarn) landscape in southern Cumbria (British Isles) to reconstruct vegetation change across the elm decline in an area with a rich and well-dated archaeological record to disentangle different possible controls. Here we find a two-stage decline in Ulmus taking place between 6350–6150 and 6050–5850 cal a BP, with the second phase coinciding with an intensification of human activity. The scale of the decline and associated human impact is more abrupt in the upland landscape. We consider it likely that a combination of human impact and disease drove the Ulmus decline within southern Cumbria. Orme LC, Charman DJ, Reinhardt L, Jones RT, Mitchell FJG, Stefanini BS, Barkwith A, Ellis MA, Grosvenor M (2017). Past changes in the North Atlantic storm track driven by insolation and sea-ice forcing. Geology, 45(4), 335-338. © 2017 the Authors. Changes in the location of Northern Hemisphere storm tracks may cause significant societal and economic impacts under future climate change, but projections of future changes are highly uncertain and drivers of long-term changes are poorly understood. Here we develop a late Holocene storminess reconstruction from northwest Spain and combine this with an equivalent record from the Outer Hebrides, Scotland, to measure changes in the dominant latitudinal position of the storm track. The north-south index shows that storm tracks moved from a southern position to higher latitudes over the past 4000 yr, likely driven by a change from meridional to zonal atmospheric circulation, associated with a negative to positive North Atlantic Oscillation shift. We suggest that gradual polar cooling (caused by decreasing solar insolation in summer and amplified by sea-ice feedbacks) and mid-latitude warming (caused by increasing winter insolation) drove a steepening of the winter latitudinal temperature gradient through the late Holocene, resulting in the observed change to a more northern winter storm track. Our findings provide paleoclimate support for observational and modeling studies that link changes in the latitudinal temperature gradient and sea-ice extent to the strength and shape of the circumpolar vortex. Together this evidence now suggests that North Atlantic winter storm tracks may shift southward under future warming as sea-ice extent decreases and the mid- to high-latitude temperature gradient decreases, with storms increasingly affecting southern Europe. Turney CSM, Jones RT, Phipps SJ, Thomas Z, Hogg A, Kershaw AP, Fogwill CJ, Palmer J, Bronk Ramsey C, Adolphi F, et al (2017). Rapid global ocean-atmosphere response to Southern Ocean freshening during the last glacial. Nature Communications, 8(1). © 2017 the Author(s). Contrasting Greenland and Antarctic temperatures during the last glacial period (115,000 to 11,650 years ago) are thought to have been driven by imbalances in the rates of formation of North Atlantic and Antarctic Deep Water (the 'bipolar seesaw'). Here we exploit a bidecadally resolved 14C data set obtained from New Zealand kauri (Agathis australis) to undertake high-precision alignment of key climate data sets spanning iceberg-rafted debris event Heinrich 3 and Greenland Interstadial (GI) 5.1 in the North Atlantic (~30,400 to 28,400 years ago). We observe no divergence between the kauri and Atlantic marine sediment 14C data sets, implying limited changes in deep water formation. However, a Southern Ocean (Atlantic-sector) iceberg rafted debris event appears to have occurred synchronously with GI-5.1 warming and decreased precipitation over the western equatorial Pacific and Atlantic. An ensemble of transient meltwater simulations shows that Antarctic-sourced salinity anomalies can generate climate changes that are propagated globally via an atmospheric Rossby wave train. Grosvenor M (2012). Human-Environment-Climate Interactions: the Neolithic Transition in Northwest England. Quaternary International, 279-280, 178-178.